Posted on January 26, 2017 by Ryan D.
This is Part 3 of a 3-part blog series. In August 2016, we sat down with three of our international staff members—Karim, Ness, and Matt—to hear what they had to say about Wildwood: the challenges and rewards of being a staff member, their favorite camp activities (Spoiler Alert: they all love the waterfront! ), and what makes Wildwood so special. Don’t miss a story! Subscribe to the Word from Wildwood blog to be notified when these and future blog stories are posted. I’m from England, from a city near Nottingham which is basically the middle of the country. What is your job title and how long have you been with Wildwood? 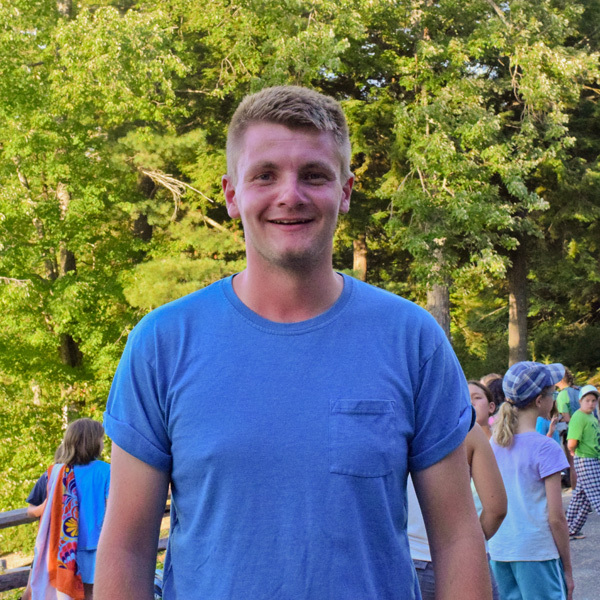 I started out in 2014 as a counselor in Abbey (13-14-year-old boys) but this year I’m the Waterfront Director. This is my third summer here. What brought you to Wildwood? Basically, there are companies across Europe, as well as England, which send you out to work in different countries. Most of them do nannying—the au pair thing—but there are quite a few companies which do camps. There’s all different types of agencies within England just for the Camps. They all have similar aims but they all do different things for you. So basically, you do a 15-20 page application form, just with the company, not with Mass Audubon. You do three references, police check, medical check, a few other things, and they mainly want to sponsor your visa and make sure that you are suitable for camp, there for the correct reasons, that you have the correct life experience. So, once you do that, you have a couple of interviews—a phone interview and a face-to-face interview—with the agency itself. From there, once you’re [determined to be] up to the UK Standard, they send it off to the American parent company where they double-check it, and if you’re up to their standards, they’ll put you onto the national database. I got very lucky. I got put on the database around 4:00 or 5:00 am and later that morning I was contacted by Wildwood for an interview, saying “We read your application and we’re really interested in offering you an interview. Would you be interested?” I said yes. That was arranged for a few days later, so we did the interview over Skype and then later that evening I was offered the job. It was a very quick process, and even camp leaders said it was abnormal for it be that quick of a process, so I was very fortunate and very lucky to have that happen. My first summer was such a shock for the first week or two, but after that, it was like a magical experience. Last year was really good, but nothing really beats the first year, in a way. It’s like, “Wow, I’m in America! Wow, this is great! Wow, wow, wow!” There’s nothing like this in the UK. There’s such a strong community bond and you feel like one big family. So, that’s why I came back in 2015 for a second year, I just wanted to experience that again. And that was such a great summer, last year. There was such a great dynamic between all the staff members. And it’s nice to see how the kids progress, as well, when you get to know certain kids that come back every year. We’re only here for 3-4 months, so it’s not really that long, but when you’re sleeping, eating, working, days off together, you build a great connection with other staff members. And probably half the people I’ve talked to throughout the years are foreign which, three years ago, I thought would never happen, but just through the connections I’ve made here, I’ve got a friend in Columbia, Hungary, one who’ll be going to Spain soon, Scotland, Wales, America obviously, England, and Ireland. So I’ve got these great connections over the three years, and 2014-2015 New Year’s Eve, some of us met up from camp and spent New Year’s Eve and New Year’s Day together. They’re really lasting friendships. I feel like the hardest part, when it comes to camp, is probably the first 2-3 weeks, which I try to explain to people. But once you’re really into camp, it doesn’t necessarily come easier, but you kind of know where you are and what your job is, so it’s not as mentally draining. This is my third summer, so I’ve been able to see kids for not just a week but for two weeks and see them develop over the years. My first year, I was with the 13-14-year-old boys and in that year, they’re either leaving camp or going on to LITs (Leaders-in-Training), so the ones who are here now are potentially going on to JCs (Junior Counselors) next year. To see them go from campers to leaders and potentially going on to be counselors—it’s just great to see that transition and it’s so great to actually see them grow. Especially the oldest units, the ones I’ve had the most contact with, it’s great to see them develop. You build a lot of special bonds. They almost become…not your friends as such, but like your younger brother or younger sister. What drew you to want to be a camp counselor? Mainly I came over here for the experience and to prove that I could do it, and to come and learn leadership skills. I was interested in working in another country and building confidence or the type of skills I may not have had previously. In some ways, three months can be quite a long time, but in other ways, it’s quite short. If I don’t like it, I don’t have to keep doing it; if I do like it, I can consider doing it again. So I was going into it very open-minded. I felt like, coming over here, I was coming for a purpose, to make a difference; I was doing something positive. Because usually, back home, in the UK, normal things to do for [people in their] late teens and early twenties are going on a girls’ or lads’ holiday, where they just go somewhere for a week holiday, and you’re not really doing anything, so it’s sort of wasteful in a way, not doing anything positive. What is your favorite Wildwood activity? And it seems to me like my favorite activity is when we’re doing sailing [with the kids] because I can go out on the motorboat and the feeling of being on the motorboat, just going down the middle [of the pond], first thing in the morning around 9:00 or 9:15 when it’s nice and cool, I can’t do that anywhere else. In general, this is quite a small camp, which I think some people prefer. And it’s not competitive. We can make it competitive, in some of the activities that we do, but as a camp, it’s very chill, laid-back, you can go at your own pace, you develop in your own time. If you wish to learn a bit more in-depth what that tree is, you can go and do that, but if you’re not too bothered and just want to be outside and admire it, that’s okay as well. But the main thing that stuck out to me in the first place, in 2014 when I started, was the community spirit. You know, you get counselors that come back for many years, and in many ways, you felt privileged just to accept the interview, the opportunity. The main thing is just getting kids outside, away from all the video games, and just making it so simple that you can just be outside, enjoying nature, without even realizing it. A simple example is playing soccer: we play it on the field, surrounded by trees, you’re outside, socializing and getting that confidence and self-esteem just by talking to other people. If you could give one piece of advice to someone considering coming from overseas to work at Wildwood, what would it be? I’d say just be open-minded. It’s not easy. You’ve got to realize that you have to be “on” 24-hours a day, 6 days a week, but it’s also a lot of fun. The first two weeks are the hardest and then you really start to enjoy yourself. The staff members have a special bond, like the last couple of years, I met up with a group of people for New Year’s Eve. I wouldn’t do that in my “real” job back at home. And when you meet up, the only thing you really talk about is camp, because you just get so many stories from camp each day; you don’t realize how many stories you get until you finish camp. And nobody understands, apart from the people here. You can try to explain it back at home, but they don’t get the full realization. This entry was posted in staff, summer camp on January 26, 2017 by Ryan D..